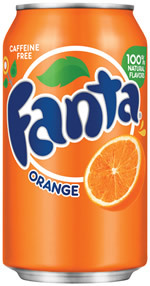 Fanta Soda made by Coca-Cola comes in over 70 flavors around the world, but their most popular flavor is Fanta Orange. 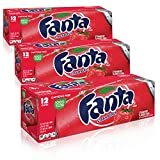 Fanta Soda features popular local fruit flavors from whatever region it is distrubuted in. Most are fruit flavored and most are caffeine free. 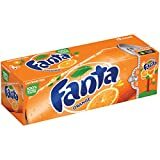 Fanta now is available in a Zero formula in some markets, which is calorie-free. Carbonated water, sugar, orange fruit from concentrate (5%), citric acid, vegetable concentrates (carrot and pumpkin), natural orange flavoring with other natural flavorings, preservative (potassium sorbate), malic acid, acidity regulator (sodium citrate), sweeteners (acesulfame-K, aspartame), antioxidant (ascorbic acid), stabilizer (guar gum). Contains a source of phenylalanine. Sugar content: 22.8 grams (per 12 ounces). 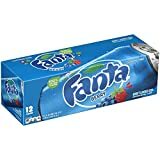 Fanta contains 0.00 mgs of caffeine per fluid ounce (0.00mg/100 ml).